Freebies in each order? That’s from SKIN18! Did you ever heard of Skin18 already? It’s an online shopping that provides Korean beauty products worldwide. Yes! You heard me right its worldwide. Who doesn’t love Korean beauty products? This company believes and I do agree that skincare is more important than makeup. Why? Feeding your skin with natural ingredients and nutritions that your skin needs is way better wherein makeup is just a coverage. They have their warehouses in China, HongKong & U.S.A. You’ll find their shipping information here . They do have a great reward program for their loyal customers. Not only that, with every order you make you’ll receive freebies with it. You can see all the details for their reward program here . You don’t even have to order also for the freebies ladies! With the reward points that you’ll get once you create your account you can use that to redeem freebies. Just have to pay the shipping fee and it will be on its way to you in no time. This is the best part of it too where everyone loves to join. They do have lots of giveaways/competitions here where you can try your luck every month. Don’t miss out their social media especially Instagram that’s where they usually hold their competitions. 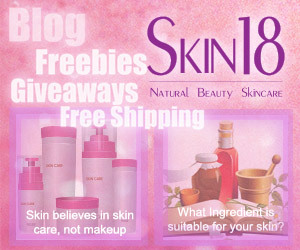 They do have Facebook and Twitter just look for Skin18. With all these info you may want to check out their Shop with the payment method and details here . Next A little Secret from BabyShop! Shhhh!